I had my first episode with what probably is some kind of tendonitis back in April 2016. I play guitar since I was a teenager (almost 15 years), always as a hobby, and as additional input, I do work everyday with a computer. The first episode that happened after a day that I played a whole afternoon quite hard. That day was particularly different than any other, because it was the first time that I change the gauge of my strings to one level higher (10-46), and additionally I did a lot of bendings. The morning after I could hardly close the fingers of my hand. I was quite shock. It was a sharp pain together with the total incapability of moving my hand. Since that day I have been a bit more cautious with the way I play guitar. I read a lot about the posture, the tension on the strings, I reduce again the gauge of the strings, not so many bendings, etc. Just for the record, in all this 15 years I have never warm up before playing. I started doing it after this happenings occurred. I contacted some professional guitarists with similar problems and I discovered (quite late, I know) the importance of warming up. The truth is that my hands haven’t improved and the pain is coming back over and over. I have been making pictures of the effects in my hands to show to doctors and get a better understanding on what was going on. I have been checked if it was a tunnel carpal, resulting as negative. I have been in hands of physiotherapists. Some massages alleviated some pain and tension for a short time, and with the help of some rubber bands I did some exercises to gain some strength in the muscles. After my experience I have to admitted that the major problems always occurred after I play guitar and/or bass. I do apply mainly the two first steps of the RICE method when the pain comes. I rest when the pain comes, and normally after three days, the pain is over and the strength is back. I do apply an ice-block in the area affected when the symptoms starts to appear. Note: It is interesting that the full symptoms normally come 1 to 2 days after the exercise was done. It got to a point that any higher than normal load into my hands (different to playing guitar) affects me in the same way. Firstly I start to feel a certain annoyance in the area (normally the same day of the activity). The day after the area starts to feel a bit numb. Back then I did not started yet with proper warming up before playing. In this phase the area affected was the back of the wrist. The redness of the area is clearly visible (also warm). Sharp pain when trying to close the fingers of the hand and numbness of pinky and ringer finger. The pain and numbness could last up to two days. Anyways this type of injure improved considerably after the right execution of exercises for warming up before playing (between 5 to 10 min). I mentioned at the beginning that I also play bass. This type of injury appears after using the thumb on the execution on the bass technique called slapping. It appears also when I play thumb style with my guitar (Wes Montgomery style). Warm up as usual. 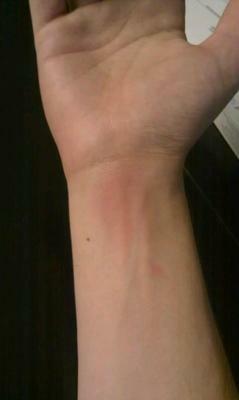 But again a couple of days later the injure manifests like shown in the picture. Sharp pain and numbness in the palm of the hand. 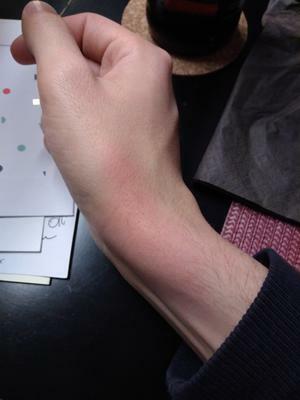 Extreme pain when doing the “Finkelstein test”. Note: My average playing sessions are between 1 to 2 hours. The third sign of what could be another type of tendonitis is presented in the back of the hand. 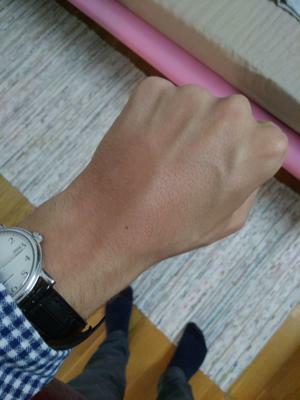 Swollen area, redness and pain when flexioning the wrist. At this point I would like to get some feedback if I am doing something wrong. I love playing guitar and it is starting to get a nightmare. Do I have guitar tendonitis? Wrist tendonitis? All of them? Does it look like chronic? What would be the best way to proceed? Any similar case out there? 1. Playing 'better' with better ergonomics etc is a good thing. But it's not a fix at all. 3. But you certainly do have a tendonitis dynamic. Said another way, there's a progressive Pain Causing Dynamic that you've been experiencing. It's not particularly complex, but there's three main factors all working together to cause pain and problem. Everything you've tried hasn't helped because you didn't adequately address any of those three factors. I don't mean that like you're to blame, I just mean that like basic math: the right things create the right results, the wrong things (or not enough of the right things) create more of the wrong results. 4. "At this point I would like to get some feedback if I am doing something wrong." You aren't doing anything wrong. No worries there. "Do I have guitar tendonitis? Wrist tendonitis? All of them?" Sure. But, the name doesn't matter. What's going on there under the surface of the skin does matter. And what's going on under there is a dynamic...multiple factors (all tendonitis, no matter what you call it, is a function of the same dynamic). "Does it look like chronic?" Sounds like it is chronic. But I think what you're asking is 'Is it fixable?' To which the answer is "Yes" (if it's tendonitis and not some other/random medical issue). "Any similar case out there?"" Yes. All tendonitis is similar. You're well within the bell curve. "What would be the best way to proceed?" I'd get and start working with the Reversing Guitar Tendonitis. It covers the nutritional insufficiency that is playing a role, the shoulder to fingertip structural issue(s), and the inflammation process (and resulting pain/redness/swelling etc). I ran out of room there.